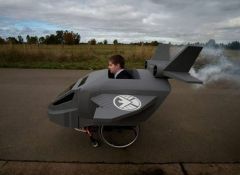 Over the years, we have posted great images of Halloween costumes made for kids who use wheelchairs. One of the families whose designs have consistently been featured in the news stories has turned their creativity and interest into a not-for-profit organization providing costumes for kids in wheelchairs. Shown in the photograph is the creation of Magic Wheelchair, the Avenger's Quinjet! Follow this link to see the story from Huffington Post (link opens in new window). Follow this link to connect to Magic Wheelchair, the company they started (link opens in a new window).